This is the moment a beautiful girl with a prosthetic leg discovers that her new doll has been crafted to look just like her – complete with a pink prosthetic leg. This one’s about to get you right in the feels – so have the tissues at the ready when you press play. Watching this video unfold, it seems that perhaps it’s someone’s birthday. An adorable little girl is toting a large doll, and squeals in excitement as she passes it to her sister, “You’re gonna love it!”. But it’s soon apparent that this is no ordinary doll. 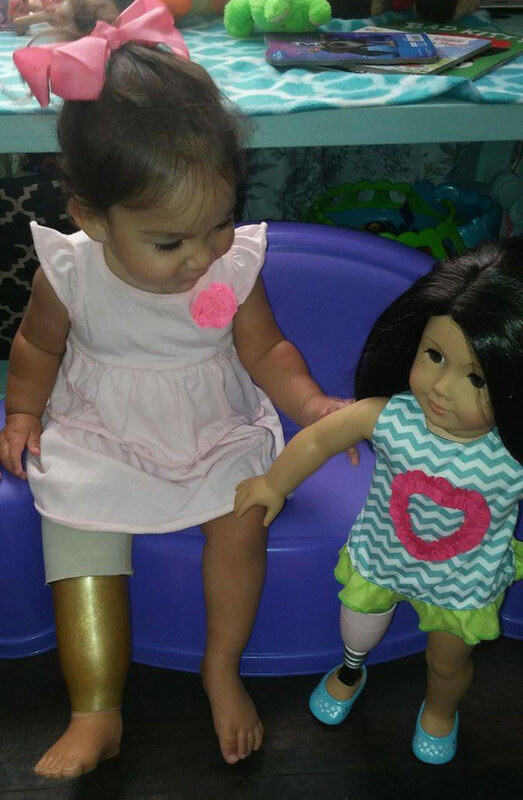 Courtney Fletcher Bennett prompts her daughter, Emma, to read the letter but she barely gets past the first sentence before she takes a peek into the box – and realises that the American Girl doll has a prosthetic leg – just like her. Tears of JOY! :)… A Step Ahead Prosthetics …Thank you! Families who have children with prosthetic limbs, or are facing an amputation are encouraged to send an American Girl doll to A Step Ahead Prosthetics so they can modify it to match the child. This is the latest in a series of companies working to create more inclusive branding around their products – including Lego releasing a boy in a wheelchair minifig, Sesame Street revealing a character with autism, Kmart hiring models of all abilities for its catalogues and Toy Like Me campaigning for the creation of dolls with birthmarks, walking sticks and hearing aids.